You know you can taste it, that feeling you will have once you've freed yourself of what it is that's holding you down or holding you back. That feeling is yours if you want it. ...want to be just a little closer to feeling free? Our life, our own fears, our obligations to others, all of these can make us feel anything but. Here's an opportunity to declare a change you want to make to get just that much closer to living your optimal life. Ready to free yourself from something that's holding you down? That "something" could be debt, a job/career (or lack of), a relationship, too much stuff, a bad habit, [fill in the blank]. If so, here's a place you can declare it and take the first steps to make your wish a reality. If you're a little stuck defining what it is you want, this post might help you generate some ideas. Declare your intention to the world! Become a member of the F2P community. All you have to do is tell us what you'll do by using the comments section. What: What it is that you want to change, start or stop? Why: What is your motivation to change? What are the short-term and/or long-term benefits you'll derive from it? How: How will you make the change? How do you plan on getting there--if you already have an idea of the action or steps you'll take (the level of detail is up to you). In addition to the above, you can also include a URL to your story if you want to offer more info. It might serve as a source of inspiration for others. Who knows, putting it out there might even clarify it for yourself. "I will earn a little more freedom by quitting my job to live more in line with my values. I work too much and what I work on I don't find fulfilling anymore. I fear life is starting to pass me by and I want to do more of what matters to me. Save as much as I can to make it easier to leave." "I have too much stuff and want to get rid of a lot of it because my home is starting to feel small and cramped. I want to feel good about my living space and be able to do more of what matters to me now and in the future. Getting rid of 500 items. Do it in 31 days. Stay accountable by tracking my progress." BONUS opportunity for rocking your own world: If you think your story is the "bomb", send it to F2P. It might just become a guest post on this very blog. Once you've made your pledge, you can share your declaration online by using the freedom badge. It's yours to proudly display. Don't forget to update us on your journey. We want to help you celebrate your victory! Once you have achieved what you've set out to do to make yourself a little or a lot "freer", tell us about it by replying to your original comment. "Before and afters" are a huge motivator and they are so cool! If you have changed your mind, tell us about that too. Life is anything but static and our reasons for doing, or not doing things, change over time. Let us know what you're refocusing on. So, what do you want to improve, change or stop? Tell us about it. We can't wait to hear about it and help you celebrate your success along the way. If you've already freed yourself of something substantial, what the heck, share it too! 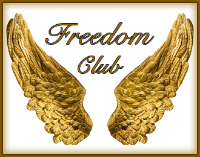 Freedom Club golden wings credit/copyright: Gilmanshin/Shutterstock.